Washington, NJ: A sanitary, custom candy processing system from process equipment manufacturer The Witte Co., Washington, New Jersey (www.witte.com), combines a vibrating fluid bed dryer, cooler, screener and integral baghouse collector to dry agglomerated sugar, cool it with ambient air and screen out oversized chunks. Each stage in the system uses the company’s proprietary vibrating technology to gently advance the hot, sticky sugar from the dryer infeed to the screener discharge without lumping, clumping or clogging. 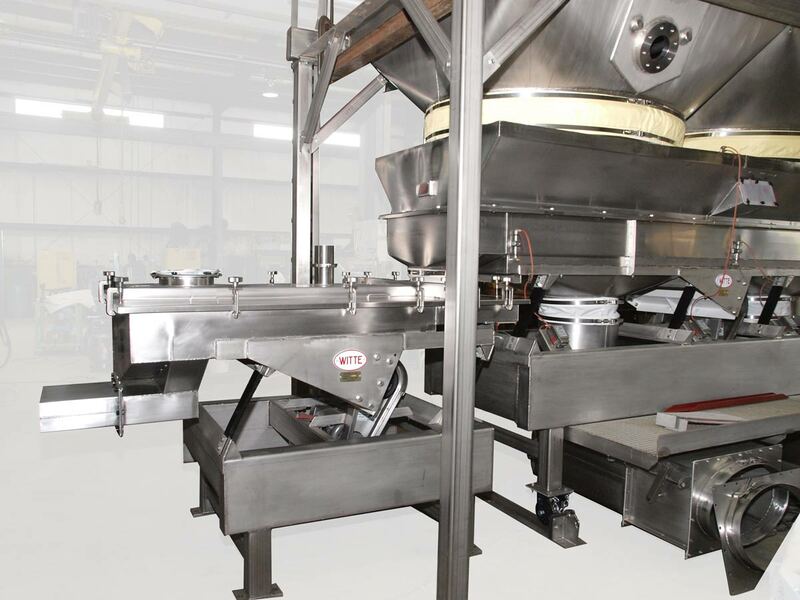 Developed for a major candy/food manufacturer, the entire food-grade Witte system features 100% sanitary, stainless steel construction for both structural and product contact areas with polished welds for smooth product movement. Effective for agglomerated coffee, breakfast cereals and other food products, in addition to sugar, the Witte design sets the baghouse collector directly atop the fluid bed dryer to capture any fine sugar particles entrained in the dryer airstream and return them to the process for recovery as finished product instead of allowing the costly sugar to be lost as dusty waste. This Witte design signature also captures the heated process air and returns it to the dryer for reuse for tangible savings in energy and a reduction in air exhausted to the environment. For washdowns, cleaning and maintenance, the fluid bed dryer, cooler and screener are designed for easy access to the interiors without any tools while the drying and cooling sections are set on casters and rails to roll out like a drawer.